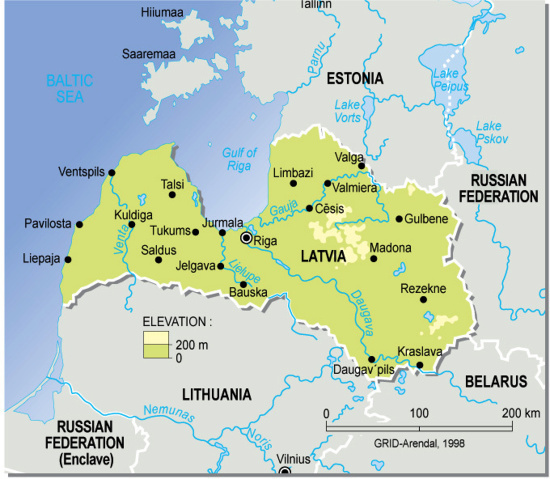 Latvia is located in Eastern Europe, bordering the Baltic Sea, between Estonia and Lithuania, comprising of 64,589 sq km. It has a population of 2,290,237 (2005). Major environmental concerns are: Latvia's environment has benefited from a shift to service industries after the country regained independence; the main environmental priorities are improvement of drinking water quality and sewage system, household, and hazardous waste management, as well as reduction of air pollution; in 2001, Latvia closed the EU accession negotiation chapter on environment committing to full enforcement of EU environmental directives by 2010.